The BLK sandwich, AKA– Bacon Lettuce & Kohlrabi– is pretty much the best sandwich ever created at Tumbleweed Farm. We had high hopes that we’d have enough tomatoes to harvest for our CSA members this week but alas, they are still a week or two out before we have enough to include in all the shares. 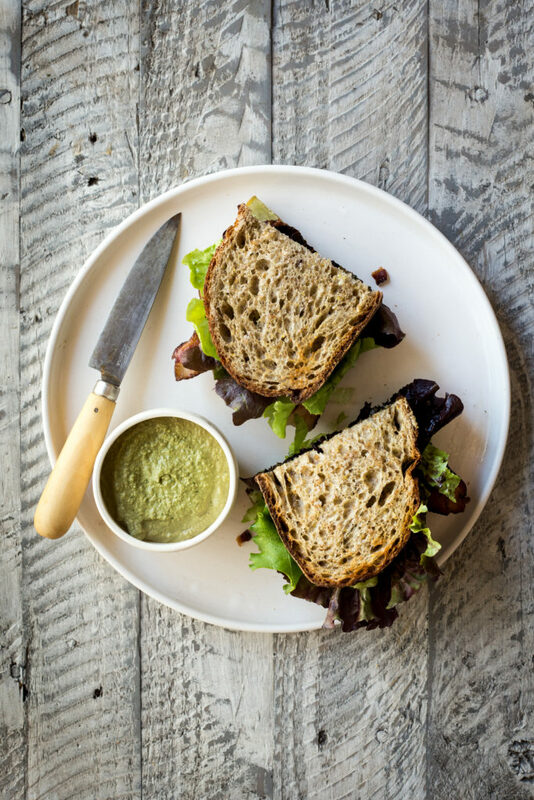 I created this amazing herbed-cashew spread that I wanted to include on a classic BLT to highlight as a “recipe of the week” for our members with all the herbs (and tomatoes we thought they’d be receiving…) but as it turns out, this afterthought of a meal has blown our minds! I know it sounds crazy to be more excited about kohlrabi than about the first tomatoes of the season but it’s the truth! The kohlrabi is sliced into thin rounds and cooked until crisp tender in reserved bacon fat from the pan. Taylor has declared this his favorite meal of the season and I don’t blame him! We used bacon we bartered veggies for at the farmers market and fresh herbs, greens and local bread to complete this simple meal. Also, instead of tradition mayonnaise (I’m not an mayo person) I whipped up an alternative spread to stand in for the creaminess that mayo creates for the classic BLT. The result is the most delicious farm fresh lunch that a couple of over-tired and cranky farmers could ask for! I hope you all enjoy this simple sandwich as much as we do! Cheers to the harvest. Drain the cashews and rinse under cold water. Place all the ingredients for the spread in a high speed blender– along with 1/3 cup of water and whirl away until completely smooth and creamy, adding more water, 1 tablespoon at a time, until desired consistency–it should be smooth and spreadable. Taste test and adjust flavors as necessary. Toast your bread in a toaster oven, out door grill, or under the broiler until golden brown and crisp. Fry your bacon in a large cast iron skillet or frying pan until fully cooked and crispy. Drain on paper towel lined plates. Pour out half of the bacon fat (save for another use) and return the pan to medium-high heat. Add the sliced kohlrabi in a single layer and cook in the bacon fat until crisp tender and lightly browned on both sides, about 1-2 minutes per side. Remove from the pan and drain on paper towel lined plates. To assemble the sandwiches spread a tablespoon or two over each slice of bread. Layer with the bacon, kohlrabi and lettuce. Sprinkle with a pinch of salt and pepper and enjoy.